Many people are vaguely familiar with Yantras and appreciate the beauty of the designs but are unaware of where the designs emanated from, the mythology behind them and exactly how they are to be utilized in meditation. While a complete explanation would require a large book, or even several books here is at least a fundamental explanation. Simply put, the Yantra is a visual tool to use in ritual and meditation. An extremely powerful diagram that can assist one embarking on the spiritual journey of returning to the primordial center and to intuit the unity of the self integrating with the cosmos. This is how Pamela and I came to the moniker Cosmic Expressionists – while yes we are artist too. Artist as generic noun seemed like way too broad a brush to describe what we are trying to communicate and share through our work. 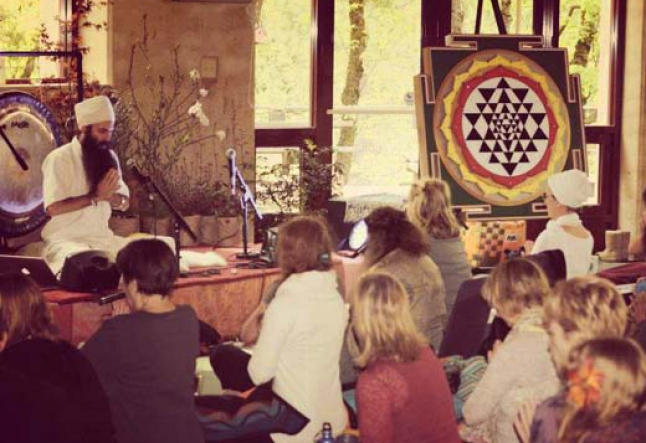 In Kundalini Yoga for example the circuits of the Yantra are connected to the psychic centers of the body, or Chakras. Hence the human body itself begins to function as a Yantra. I find it extremely useful to re-visit the physical concept that virtually everything in the cosmos is really just a configuration or manifestation of vibrational energy. i.e. String Theory. This analogy seems to be well received by the more scientific oriented cultures. From this perspective we can think of Yantras acting collectors and re-distributors of specific cosmic vibrational energy. When meditated upon in a specific sequence and disciplined manner the Yantra enables one to proceed further along the path of personal fulfillment and metaphysical understanding. In other words if there were a Yoga Depot, you would find Yantras located in the power tool section as they are serious Power Tools For Personal Transformation. Beyond that Yantras are multi-faceted. Let’s consider the Sri (Shri, Shree) Yantra for example. 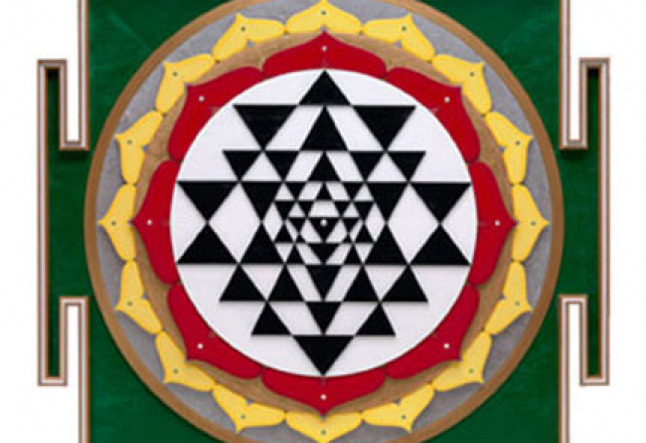 This is probably the most widely recognized Yantra. The Sri when used by the individual in meditation one navigates the Sri from the outside in towards the bindu (center). The journey represents a ladder or a series of steps for the individual as he/she ascends on the meditative psychic discovery of the true self. Conversely when contemplated from the bindu (dot) outward the Sri represents the Vedic vision of the evolution of the cosmos. It is important therefore to consider and contemplate these diagrams in at least three dimensions. Ideally, in many more dimensions as we ascend to a higher understanding of not only ourselves but also our place in time and our existence within the greater cosmos. Above: photo of our artistic interpretation of the Sri Yantra arranged in a 36 piece solid cherry frame. 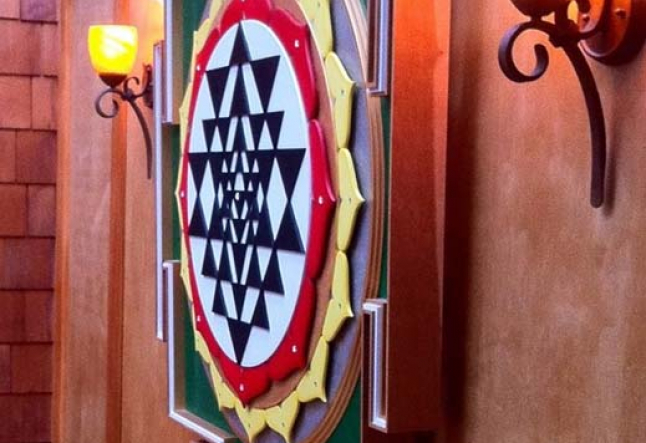 The Yantra blesses the entrance of our home welcoming prosperity and abundance.